June early morning sky from the bedroom window. For the past 22 years I have simply enjoyed the views over the Bristol Channel, which flows past a salt marsh just beyond the garden wall of our house in Portishead, North Somerset.My husband, Stephen Jacobson, has regularly painted the views of the sea and landscapes which surround the house, while I have simply enjoyed the ever-changing light, skies and tidal waters of the estuary. 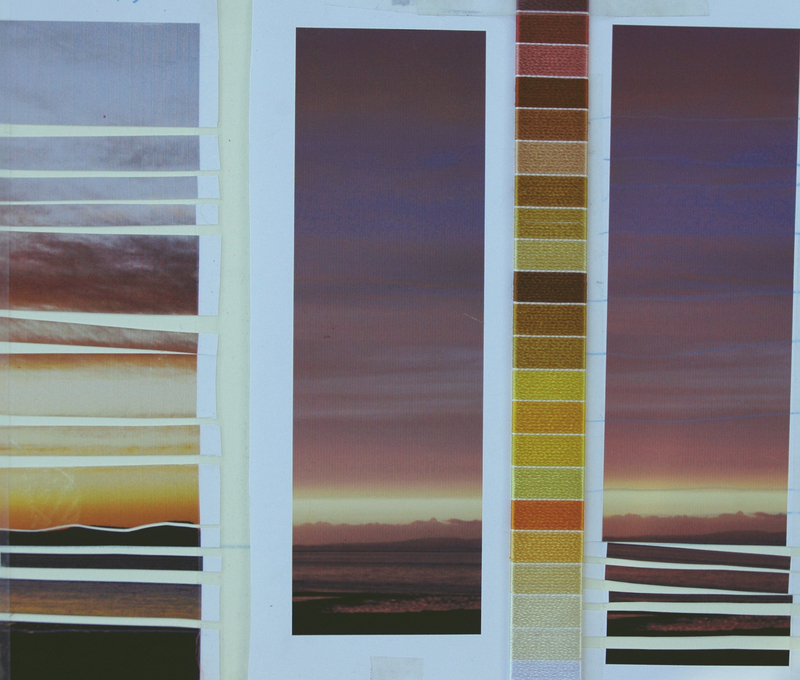 But about a year ago I started to make notes of the early morning and late evening skies looking towards the Welsh hills. At first when ever I woke up very early and just before rolling over back to sleep, I made quick notes of the colours, they were so stunningly beautiful I just wanted to remember them later – the notes were really just lists or stripes of colour, the marsh, the water, the hills, the sky striations of clouds or simply the blend of colours from reds of the sunrise up through to the blues of the morning sky. 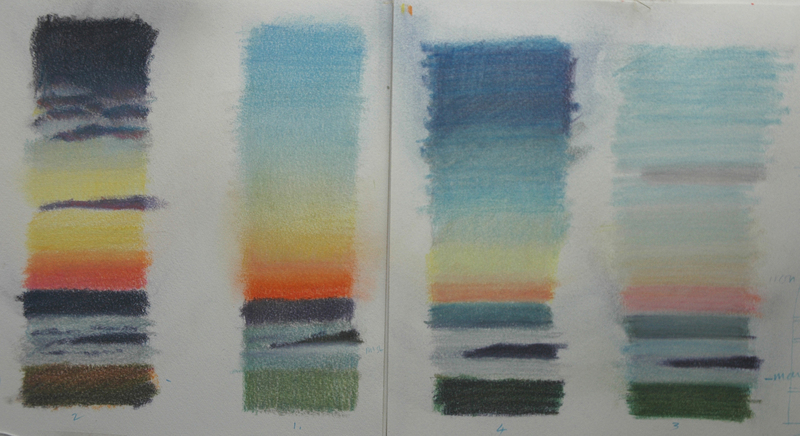 Then I made pastel colour studies from the pencilled lists later on, before the image in my head had disappeared. In the evenings I took photographs of any good sunset, well just after it had set, as the sky lights up in warm gold and pink striations as the light catches the underside of the clouds and vapour trails. 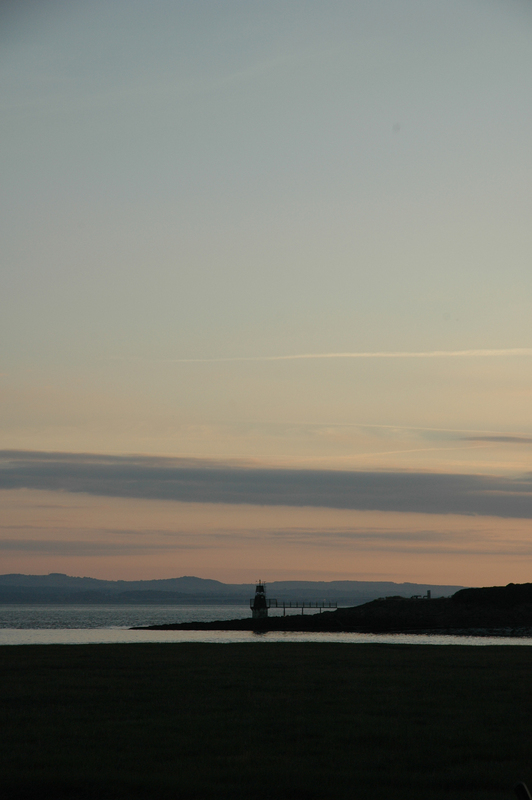 I then started to take photographs during the day, trying to keep a record of the changing light and tides. But interestingly, when we had the recent ban on air travel due to the Volcanic dust threat, the skies here were not at all spectacular, it appears that most of these striations are in reality, vapour trails. September sky looking towards Wales. 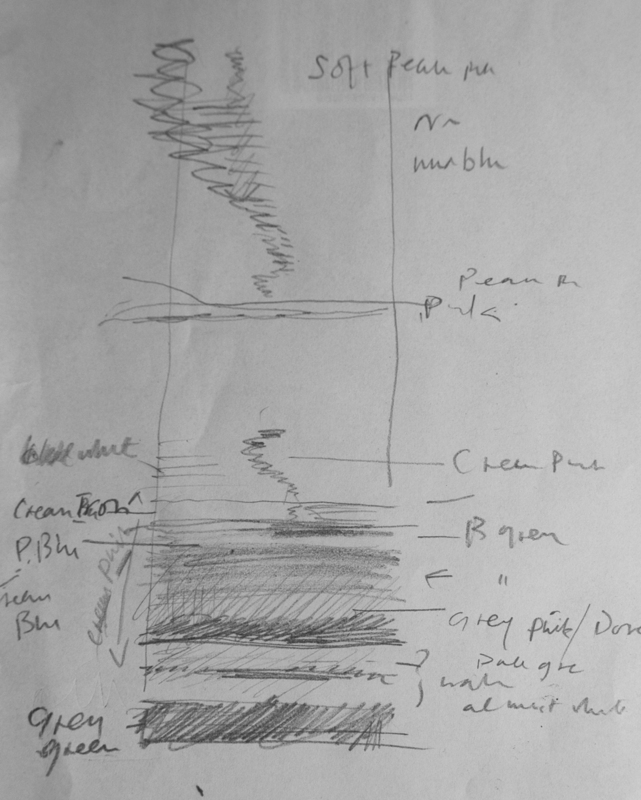 I had no idea or real wish to make any work from these notes, I just kept them in a work book and sometimes cropped the photographs to make them conform to same shape as the scribbled morning lists. I did think that they reminded me of the strips of coloured yarns in my various colour charts and pinned some of them into a work-book. The strip shape, I realised later, has been suggested by a narrow window strip made by glazing bars on either side of the main windows of the house, this design is a feature of many of the older houses in the town. Then late last year I went to see an exhibition at Tate Liverpool called Colour Chart: Reinventing Colour, 1950 to Today, and it was full of colour chart paintings from the early American painters of the 50’s and 60’s. Here were simple colour strips and squares on white grounds, they were just like the embroidery thread charts. I decided that at the first opportunity I would develop some larger pieces of work, using the charts as a device for putting the strips of colour together but was it to be in enamel or embroidery? Eventually the opportunity has presented itself, I am going to make a series of large enamel panels which can hang in other people’s gardens, evoking the wonderful skies we get here. They will be made for the North Somerset Arts Week, as an open studio exhibition. 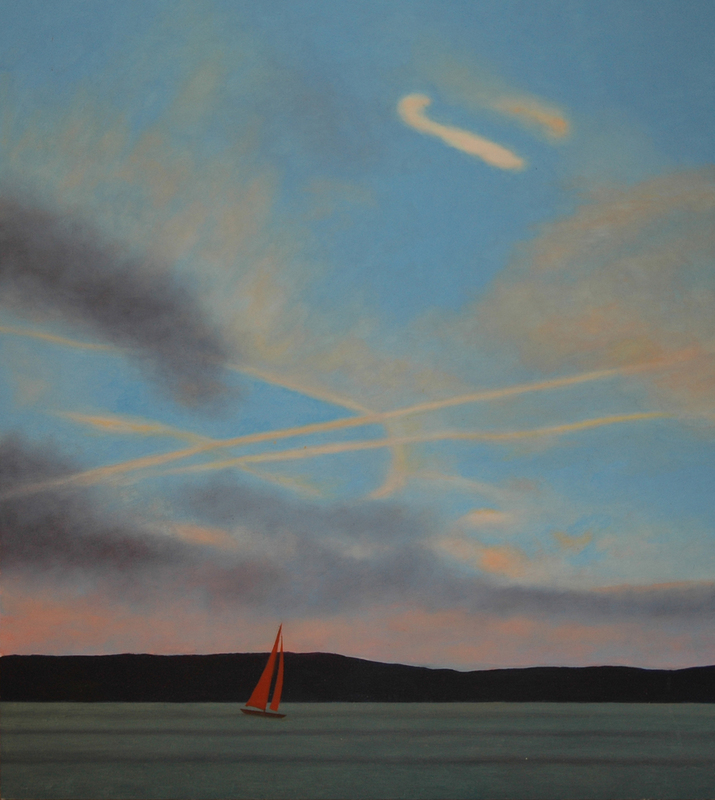 Six other artists who live in this area of Portishead and are inspired by the estuary to make their work, are exhibiting under the title of The Severn Sea – the old name given to this particular wide stretch of the Bristol channel formed by the confluence of the rivers Severn and Avon. So watch this space for further developments, I have about 10 months to produce the new work and it has to be done in odd moments between my other projects and commissions. Meanwhile I will leave you with yet another striped sky taken a few days ago. 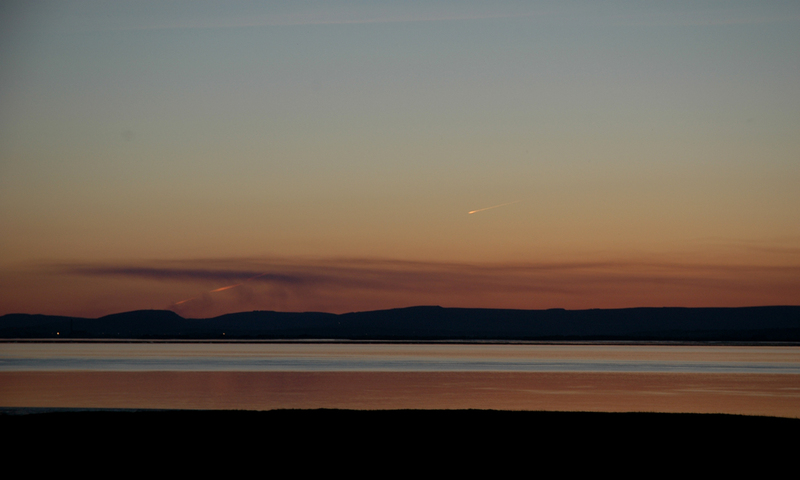 The latest after - sunset over the Welsh hills - taken early June 2010. Categories: Drawing, The Enamelled Garden | Permalink. I love the stripes !! !